Preheat oven to 400° F. Toss potatoes with olive oil and season with salt and pepper. Spread out on a baking sheet. Roast for 30-45 minutes turning with a spatula two or three times, until the potatoes are golden brown and crisp. Allow to cool. Toss arugula and kale in a large salad bowl. Top with steak, potatoes, tomatoes, bacon, red onion, and croutons. 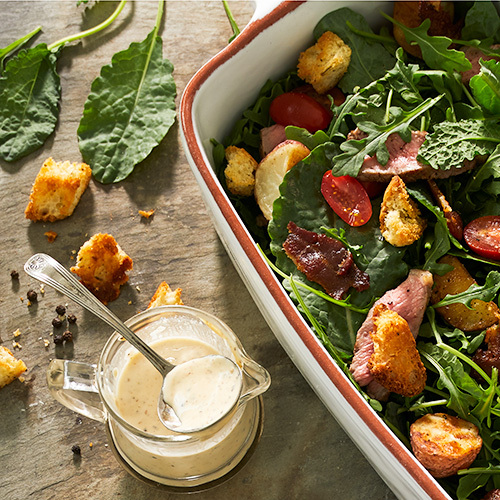 Drizzle enough Buttermilk Peppercorn Dressing to lightly coat the salad when tossed. Serve immediately.